We’ve heard a lot about urgent climate action from “world leaders” in developed countries, yet actual concrete achievements have been limited. The rich world may soon be shown up by small, tropical island nations which have plenty of wind and sun and aren’t lumbered with outdated, base-load power plants to keep running. Plus these islands are among the countries most threatened by climate change. No wonder then that of the 15 nations to fully ratify the Paris climate agreement on the day it was signed in April 2016, 13 were tropical island states. Impressive developments in the sustainable energy sector are already evident across the Caribbean. Growing expertise in renewables, climate change and resilience, along with a 2014 study on the Barbados energy sector, all demonstrate the relative ease with which small island states could transition to 100% renewable energy systems. Similar processes are also taking place among islands elsewhere in the tropics including Aruba, Seychelles, Mauritius and Pacific Island Countries. These changes could happen in a matter of years rather than the decades predicted for industrialised countries. Small island states often have some of the highest electricity prices in the world. Unless they happen to be sat on big oil or coal reserves (and most aren’t), they’re forced to import their energy and can become “locked-in” to costly and polluting fossil fuels. It’s a big economic drag. However, Caribbean people are known for their optimistic outlook on life and this “locked-in” scenario could actually spur on these islands to being among the first countries in the world to transition to 100% clean energy systems – a special feat given that today most of these islands are powered almost entirely by fossil fuels. A country’s energy system is usually comprised of base-load and peaking-load power plants. Base-load plants cannot be ramped up or down very fast, but are able to provide cheap power. They include nuclear, coal plants and combined cycle gas turbines. Peaking-load power plants are able to quickly ramp up or down in order to meet the fluctuating demand of customers on the electricity grid. Examples include, hydroelectric plants, gas turbines and, pertinent to small island states, low speed diesel engines. Small islands derive most of their electricity from these low-speed diesel engines, which can work well as a backup for intermittent wind and solar power, until a suitable storage medium can be deployed, such as pumped-hydro. Conversely, large industrialised countries are restricted by their existing large coal or nuclear power plants, many with decades left to run. So both technically and economically, small island energy systems have several advantages, when compared with large industrialised countries. 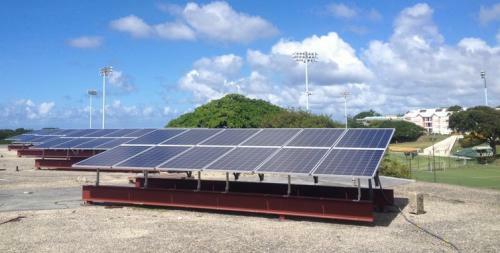 Being in the tropics and experiencing trade winds, many small island states also have exceptional renewable resources. Over its lifetime, a solar PV system located in the tropics will produce over 50% more electricity than an identical system installed in the higher latitudes in say Europe or North America. The exposed windward coasts of these islands are often rural and experience enviable wind regimes; far from the tourists, wind energy experts already describe these islands as practically offshore wind platforms. Utility-scale wind has the added bonus that it can provide fresh stimulus to agriculture sectors suffering from declining sugar cane exports. Of course electricity forms only part of a country’s energy demand. On small islands, around 50% of the energy can be used by transport but again these states could speed ahead of the pack by electrifying their vehicles too. Pump prices are high as all petrol is shipped in, so the relatively short journeys on small islands make them ideal for today’s short-range electric vehicles. In Barbados, 4% of all new vehicle sales are now electric – still a small slice of the market, but far above that in the US, China or almost all European nations, and up from 0% just a few years ago. Small island states have the potential to rapidly transition their energy systems to renewable energy. However the opportunity and rewards are still not clear to all. Barbados, one of the first countries to ratify the Paris climate agreement, will soon celebrate 50 years of independence. What better way to mark the moment than to achieve energy independence through a bold plan to power towards 100% renewables? somewhere i read that solar,wind energy is also negative energy source.For production of solar panels already lot of fossil fuel has to be burnt.Solar panel,wind mill can't produce in it's entire life that much of energy which was needed for production of panels.Is it so?